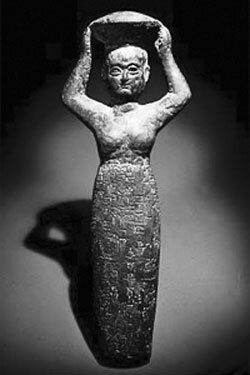 Part 2 of this series introduced Ninkasi, the Sumerian goddess of beer, and the hymn of praise dedicated to her. 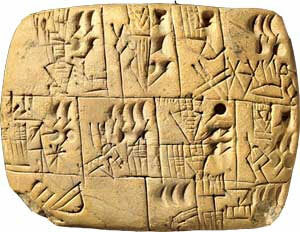 But when was this hymn written, and what relevance did beer actually have in the everyday life of the Sumerians? It’s thought that the hymn was written around 1800 BC, though it may be much older—brewing evidence dates as far back as 3500/3100 BC at a Sumerian settlement called Godin Tepe, which is one of the locations where archaeologists found chemical traces of beer inside pieces of a broken pottery jar (as mentioned in Part 1). Godin Tepe was an important stop for trade along the Silk Road trade route, and another Sumerian city called Ebla is where many of the clay tablets containing administrative lists of beer-making ingredients were found. 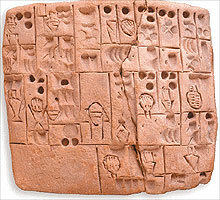 The tablets date from 2500 BC, and show that Ebla was brewing a hearty selection of beers at its height. They used fresh water and boiled it, making beer a healthier (and safer) drink than water, which could be contaminated by animal or human waste. Because it contained plenty of nutrients, every indication is given in the tablets that beer was a staple of the Sumerian diet—even laborers were given beer as part of their rations when on the job, and was consumed with… a straw. Yes, a straw. While that may be a ludicrous concept to the modern beer-drinker, this Babylonian invention helped the beer drinker to avoid ending up with the bitter brewing residue in his mouth. These straws were made of metal, bronze, or gold, and were rather long—one on display at the Oriental Institute Museum in Chicago is around 40” long. 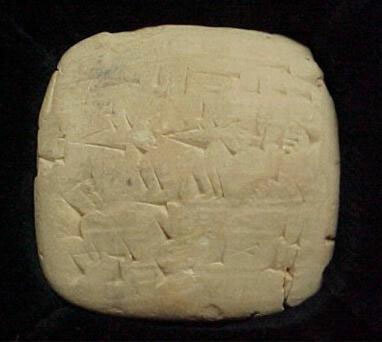 And while this ancient beer was traditionally brewed by women on a daily basis in the home, it didn’t take long for beer to turn commercial—a tablet from 2050 BC called The Alulu Tablet (Ur) contains an ancient receipt for beer delivery by the brewer named Alulu. Although most people today are more familiar with the concept of singing a rousing shanty over a tankard of ale—or stepping up to the karaoke machine after a few too many Coronas—the concept of singing and drinking being intertwined has been around for thousands of years. 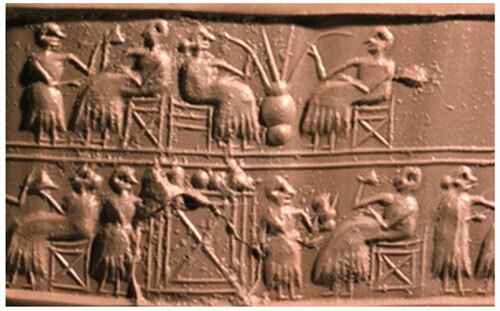 In fact, as mentioned in Part 1 of this series, the Ancient Sumerians had their very own hymn dedicated to a special deity, the Goddess of Beer. “A hymn to Ninkasi” is a poem that describes the goddess’ recipe and process for making beer, and praises her for doing things like putting piles of grain in order, and setting up the fermenting vat. In Sumerian mythology, Ninkasi is the daughter of Enki and Queen Ninti, and is one of eight children created to heal her father’s wounds. Along with being considered the goddess of beer, she was made “to satisfy desire” and “sate the heart”… probably through the beer-making process, which she performed daily. Too bad for the Sumerians, though—Ninkasi’s beer was made for the other gods, who apparently liked to get their drink on before ruling for the day. Or maybe they drank on the job, considering Sumer’s history… but regardless of the technical details, clearly the Sumerians had a very high regard for their beer. Here are a few select phrases from “A Hymn to Ninkasi”, but you can read several versions of the full translation here or here. For decades, it was thought that the ancient Sumerians were one of the earliest people groups who brewed their own alcoholic beer—ancient writings and traces on ancient vessels revealed that these Mesopotamian people loved their fermented cereal juice… but no one has been quite sure how they actually made it. But, historian of science and cuneiform scholar Peter Damerow wanted to better understand how the Sumerians brewed their beer, so he decided to review all the relevant finds about ancient beer production (and consumption! ), including cuneiform tablets from 4,000 years ago, to see what he could learn. Unfortunately, he didn’t learn a whole lot. 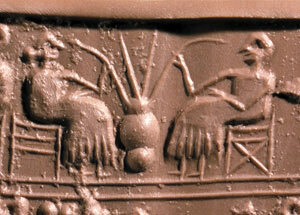 The legacy of Mesopotamia’s administrative texts didn’t include the kinds of clues needed to be able to understand Sumerian brewing techniques… and left Damerow with the conclusion that the Sumerian brew might not actually have been beer at all. The texts Damerow studied definitely showed the right products for the job, though—deliveries of emmer wheat, barley, and malt, but almost nothing on the actual brewing process itself. But why would the Sumerians have written the recipe down, other historians protest, because the audience the texts were made for would have already been familiar with the brewing process. Writing it down would have taken up valuable shelf space, so to speak. It also doesn’t help that the Sumerian bureaucrats that created the administrative texts used different systems of measuring, recording, and calculating, depending on the objects they were counting or measuring. And where the recording was being done. And in what time period! And even an analysis of the “Hymn of Ninkasi”—a hymn that glorifies beer brewing—didn’t reveal anything new, or talk about how the brewing was done. Back in 2006, there was research done that attempted to reconstruct the ancient beer brewing process, but Damerow’s review of that study led him to conclude that it only showed how modern brewing methods can create beer under similar conditions in a 13th-century settlement called Tall Bazi in Syria, and may not be representative of other locations in Mesopotamia (it was a big place!). So, the old theory about Sumerian brewers crumbling flat bread into their mash to create “bappir” (“beer bread” in Sumerian) may not be true after all. Underneath a Leicester car park , more than 400 years after his death and several hundred years of asking “where on earth is Richard III?”, the former King of England has made his mark on history one final time. Archaeologists set out in August 2012 to search for the lost site of Greyfriars Church, which Henry VIII demolished when he dissolved all the monasteries, using fixed points between maps via historical sequence. 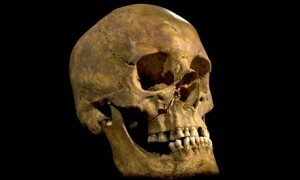 The comparison worked, and the team was able to find the hastily-buried bones of a king underneath a modern-day car park. At the same time, a British historian named John Ashdown-Hill was using genealogical research to find matrilineal descendents of Richard’s only niece whose line is still extant. He tracked down the son of a woman named Joy Ibsen, a 16th-generation great-niece of the king—and though she passed away in 2008, her son was able to give a mouth-swab sample to the research team so that they might do a DNA comparison. Archaeologists, scientists, historians, and researchers waited with bated breath as the DNA from a living descendent was compared with the human remains found on the excavation site. It’s important note what made archaeologists suspect the skeleton they found might be Richard III: The location (former Greyfriars Church), the body was an adult male, the body had been buried under the choir area of the church, the spine showed evidence of severe scoliosis, and there appeared to be an arrowhead still stuck in the spine, not to mention evidence of a “mortal battlefield wound in the back of the skull” (according to archaeosteologist Dr. Jo Appleby). 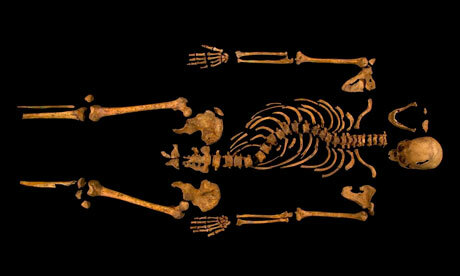 And on February 4th, 2013, the DNA results were released and the University of Leicester confirmed that the body in the car park is, beyond reasonable doubt, the remains of King Richard III, only 32-years-old at time of death. The arrowhead, however, was revealed to have been a Roman-era nail that was likely in the ground and disturbed when the body was buried. The perimortem injuries included part of the skull having been sliced off with some kind of blade weapon—the researchers suspect that because of this evidence, Richard III’s helmet had been knocked off before the killing blow was delivered. Another skull injury was about 10cm deep, from one side of the skull to the other. Other injuries are thought to have been “humiliation” injuries, including a pelvic wound from a weapon’s upward thrust. As it stands, the remains of King Richard III will be re-interred at Leicester Cathedral in 2014 (after all necessary studies are completed), and a museum opening is planned at the same time, to be located in the buildings adjacent to the dig / grave site.